The Yo-Yo Fight Between Mayweather and Nazukawa Is Back On…Again! 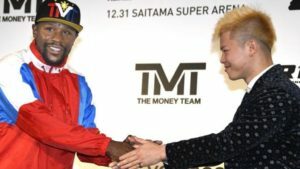 You’d swear they were playing a cruel joke on us, but Floyd Mayweather says his fight against Japanese kickboxer Tenshin Nasukawa is back on……again. New Year’s Eve is gonna be EPIC! The undefeated five-weight world champion appeared at a press conference earlier this month to announce the fight, adding he had signed with Japanese MMA company Rizin Fighting Federation. But just days later, Mayweather said that he had been blindsided at the press conference, with the news of the fight – which was scheduled to take place in Japan on New Year’s Eve and that he had never agreed to it in the first place. He has now announced himself that he will fight Nasukawa in a nine minute exhibition match that will have “no kicking” and says that this fight will be the ‘highest paid exhibition ever’. “There’s no official fight. It’s an exhibition. A small, nine minute exhibition. No kicking. It’s going to be the highest paid exhibition ever. Just for promoting this event I’ve made seven figures. It’s a no-brainer. Just because I’m retired, I still make appearances around the world and make a ton of money.” This is no idle boast since Forbes magazine named him the World’s Highest Paid Celebrity earlier this year. The no kicking rule will work well in Mayweather’s favor since he has a perfect record of 50-0 as a boxer. But since Nasukawa is both a Kickboxer and Mixed Martial Artist, it will be interesting to see how well he deals with these confines. Regardless of the outcome though, it won’t count on record. We are definitely having a full-on beer night when this happens. What about you?